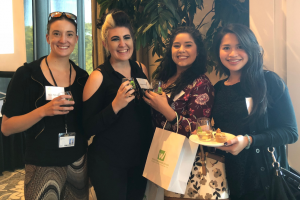 This past Thursday, the ladies of our Human Resources Department attended Wine, Women and Chocolate, hosted by the Women’s Resource Center. Established in 1973, the Women’s Resource Center advocates for women to achieve economic independence through meaningful employment. The night consisted of wine tasting, chocolate pairings, ice cream, and Networking with other Female Leaders in the Workforce. You can learn more about the Women’s Resource Center by clicking here.